Cam model websites can be used as dating websites to meet Ukrainian women online. However, you also have to be indulgent because Ukraine is one of the countries in Europe with the lowest English proficiency. So, you may have to wait for the cam model to translate in Ukrainian or Russian what you typed. Then, she would type an answer in Ukrainian, translate it in English. This can be a bit slow. We tests camcontacts and we met women from Kiev, Odessa and Donetsk. We audio chatted and we typed when the cam model didn’t understand what we had to say. Some women connected from their appartment and some women connected from a studio. When they connect from an apartment you can see there are few items in the room, it is dark. The walls are no colorful and the webcam video feed is not of high quality. 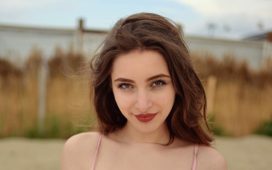 Find an example of Ukrainian cam model “hotnbitterChoco” from Ukraine on Camcontacts. This website allows you to exchange personal details like an email address. But, before you do so, please take the time to check if the cam model is trustful. Camcontacts allows two chat mode: the open session chat mode where other people can also enter the chat and chat with the cam girl and the one2one exclusive chat mode where no other guest can spy on you. There is an applicable price rate per minute in both cases. There is a wide variety of personalities. Some cam models are sweetheart and willing to meet someone and some are just interested in role playing. So, it can help you save money if you read the description of the cam model first.